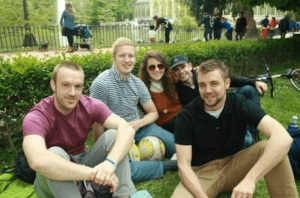 Our graduate, Steve, gives you an insight into his daily life as an English teacher in Madrid. You can read more about what brought Steve to Spain and a typical TEFL day here in the capital. Let me begin by introducing myself as a Midwest American. I grew up outside of Chicago and graduated from the University of Minnesota with a degree in English and Cultural Studies Comparative Literature. Though it’s not a bad major and I’m rather passionate about literature, was I going to write a book? Unlikely. I had been working as a debt collector during the last two years of school and after receiving my degree I was at a crossroads: take my boss’s job in the corner office and grow roots in the suburbs of Minneapolis, or take a gamble with the money I had saved and do something I would be excited about. I had already gotten a taste of what was to come: traffic jams, ironed shirts, spreadsheets and water-cooler banter. “What did you do this weekend?”, “Oh, I was so tired I don’t even remember.” (A common conversation in my line of work) I was too young for this. I wasn’t satisfied spending the majority of my life in a cubicle, living from paycheck to paycheck just to make my car and rent payments. So, I started searching. The idea of teaching English abroad came up and it seemed like the perfect fit – I saw lots of really great blogs about people that had done it and I had a few people at parties say they “had a friend that does that, they love it” and my interest continued to rise. I started doing research into exactly what this life as an English teacher would entail. In typical paranoid American fashion, I was suspicious of every tefl/esol/tesol etc. company I came across. Many of them offered deals like “sign up now and save 50% on a degree!” What does that mean? This is an investment in myself and my career/life, not a Netflix membership, so when I came across TtMadrid and got in contact I felt a great sigh of relief because, low and behold, I spoke to a human being rather than a marketing email blast. I sent a hundred emails back and forth with their fantastic staff, and eventually took the leap. I wake up to my alarm blaring at around 7:30am, roll out of bed and make coffee. Sound familiar? The exception being that I live with an Italian guy, a French girl, and a Spanish guy in a flat in the most popular area of Madrid. There’s no dominant language in the house so we make morning talk in a mixture of English and Spanish. I take a shower and I’m out the door with my headphones on and a simple packed lunch, and if I’m running late and hungry. No worries because there are fantastic bakeries on every corner making all the European croissants, baguettes and pastry delights that you’ve seen on TV for less than 2 Euros a pop, so I can grab something on the way. I take the metro to the school that I work for as an Auxiliary. The job is fantastic; the students look forward to seeing me. As I approach the school I hear one of them yelling “ehSteve! ehSteve! Have you been to Orange County Choppers?” Bless their little hearts, I tell them “Yes, all the time”. The lessons are mostly delivered by bilingual teachers and cover a large range of curriculum. In Art class (plástica) I give a short presentation on symmetry (in English) and walk the students through creating a smiley face using basic geometry. I had prepared the lesson the night before with the help of a YouTube video, and it goes swimmingly. The next class is gym, where I play basketball with some 13-year-olds. Then I have a break, then gym again, then I go home. On the way home I pass through the historical areas of downtown Madrid, loaded with sculptures, fountains, and amazing architecture that is older than anything I’ve seen before in the United States. When I get back to my apartment I make a quick sandwich with part of a fresh baguette, olive oil, fresh tomatoes and jamón (Spanish ham) before setting off to do a private lesson with a guy that works for a technology company. I was referenced to him by TtMadrid and the lessons are done at his home which is a 10-minute walk from my apartment, and we chat for a half hour and laugh about the latest Game of Thrones episode (conversational English 101). Then I go over a business proposal for him (I used to do this for free in my old job) and after an hour, I leave. I don’t have “class” with him again until next week. When I finally return home it’s about 5pm, my Italian roommate is cooking something that looks strange but smells and tastes fantastic; it’s ratatouille. From this point I could go meet friends nearby for tapas and drinks, but I decided to stay in and catch up on Game of Thrones. I plan out a few lessons for the upcoming week and Skype with my family. All in all, a very productive day. There is no difficulty in getting a job after graduating from TtMadrid as their contacts and advice are second to none. After Tt coached us all on how to form our resumes (something I felt confident in as I had done it several times in the States)–they were sent out to agencies and academies all over Madrid and Spain, tailored to our interests and professional goals. Some people want to focus on business English, which was my case because the language of business was something I felt fluent in. Others were more focused on teaching beginners and children, but the idea of working with kids scared me at the time. So I received an email response immediately from a placement agency and met for an interview to begin business English. My credentials with Tt were enough proof that I would be a capable and well-rounded teacher, so they simply laid out my choices in front of me. Soon I began working with a large company for over 3 months, meeting with 5 businessmen, 3 mornings a week. Our lessons were focused on conversational English and helping them with international correspondence (emails). The guys were great, every class was so much fun, and they were incredibly respectful of this 25-year-old kid being in charge for 2 hours. The experience helped build confidence and understand the importance of imparting my knowledge of my language and culture; I realized that people were sick of the strict, starchy classrooms they’d grown up in, having English pushed down their throats. This just felt like a group of guys hanging out over coffee. But alas, the time came when I was in search of a position with block hours. I remained friends with the guys from my class, and we’ve all met for drinks since parting ways. In spite of my fear of children, I applied for an Auxiliar position (native English classroom assistant in a secondary or primary school in Madrid). I figured I should get out of my comfort zone a bit, and the experience working with kids was likely to get me further in a teaching career back home. I interviewed with the British Council for an Auxiliar position and, once again, my Tt credentials assured them that I was prepared for whatever they threw at me. The interviewer laid out several choices of places to work, and I chose the one that best suited me. Boom, I secured a well-paid and secure job as an Auxiliar de Conversación. I have been doing it ever since and I am so happy to be living the dream – living and working in Madrid!